Many printer brands allow users to design label print jobs that use printer memory to execute simple functions that improve the speed and efficiency of label printing. Upgrading the software and/or hardware may accidentally lead to changes in print drivers and fonts that will interfere or totally disable the use of that feature. Careful attention to use of printer fonts can help resolve the problem. The serial number (^SN) function in Zebra printers allows you to send ONE copy of the label design into the printer and then instruct the printer to reprint it X many times incrementing a serial or counter number for each label printed. 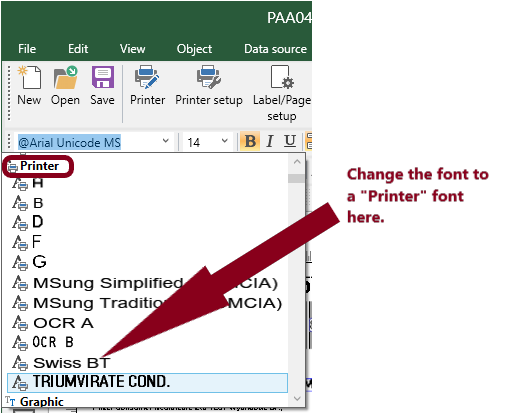 For your TEKLYNX label software (CODESOFT, LABELVIEW, or LABEL MATRIX) to use this function, you must use the TEKLYNX embedded printer driver (see image below) and a printer font when displaying the serial number. If you don’t use a printer font, the ^SN function cannot be used since the printer job information will contain and image of the serial number but not the ASCII for the number itself. When changing or upgrading printers or PCs, users may accidentally or even temporarily switch from the TEKLYNX embedded drivers to a Windows driver. When that change is made, the TEKLYNX label software will automatically change all the printer fonts into Windows fonts. In doing so, the software will be forced to abandon the ^SN feature and render a separate label image or print job for EACH label. In some situations, this change may go unnoticed by the end user. In others, they will see the fonts look different and/or the serial function does not work as well as it once did.